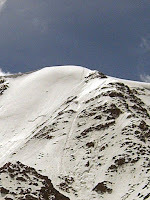 On the left is the upper part of the Tasachwand in Pitztal from about a week ago. The tracks that are visible on the upper right side of the flank are from me, Christos and Vaclav. Climbing the 600 meter north face was the highlight of our short four-day trip to the Tasachhaus. We were also able to climb on the Sexegartenerspitze. We climbed through mixed ground in a couloir placing rock protection as we ascended the 250 meter line. Conditions and weather were good in south western Tyrol. There was still quite a bit of snow on all of the faces and on the glaciers. the other north face climbs, such as Brochkogel, Petersenspitze, north side of the Wildspitze, etc., all looked good. There is an abundance of alpine climbing possibilities in couloirs, faces and ridges in the area. Additionally, the Taschachfener offered some nice training ground for steep ice.